Mudgee get ready for an Aussie rock and roll invasion! 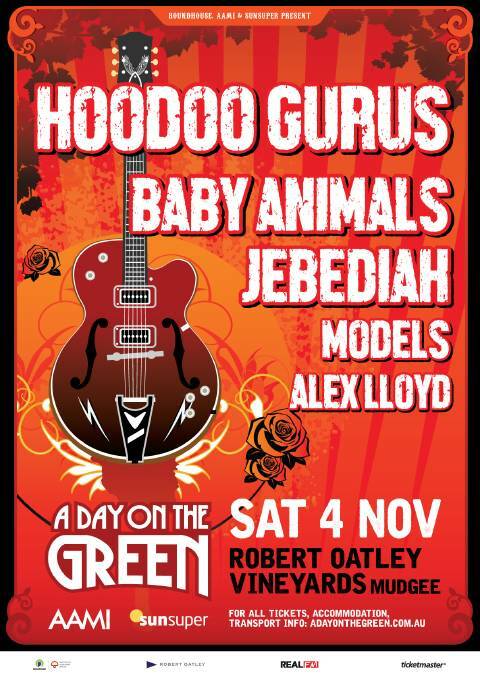 Hoodoo Gurus will be headlining this year’s A Day On The Green concert at Robert Oatley Vineyards. Other Aussie legends Baby Animals, Jebediah, and Alex Lloyd will be joining us as part of this great day out. This summer season marks the 17th year of a day on the green, which started in January 2001. After more than 425 shows and 3 million happy patrons, the a day on the green experience of good food, good wine and great music is firmly established as one of Australia’s most popular concert events. a day on the green is fully licensed event. Strictly no BYO lcohol. Food will be vailable on site or BYO picnic. Deck chairs and picnic rugs are recommended.